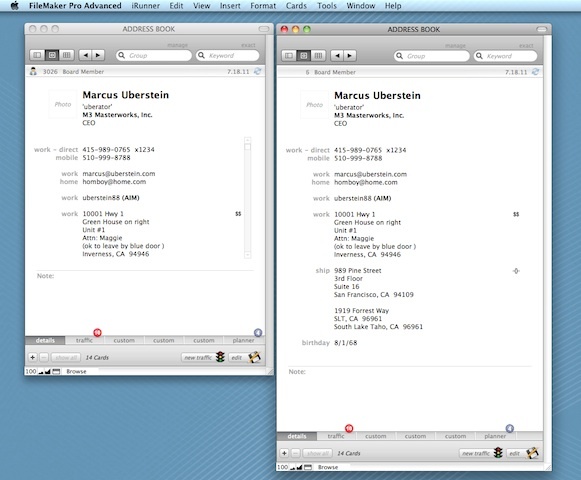 I found myself staring at the OS X Address Book and wondering, “how did they do this?” I couldn’t help compare this little application to the many FileMaker-based contact management solutions I have seen, and concluding, a bit sadly, Apple’s is nicer. Now, comparisons between OS X-native code and FileMaker Pro are not always fair to begin with. However, I felt the Address Book presented some useful ideas and perhaps a starting point for a different kind of FM-based contact management solution—one that looks and behaves more like Address Book! Once I got started, I realized I would need to work on making FileMaker Pro feel different. Because I really like all the white space of Address Book, one of the first items I tackled was how to make the portal scroll bar disappear if there were no additional records to display. additional portal rows when it grows vertically. // has window content height changed from default? // total visible rows, has content grown > one row's height? Afterwards, I found that others had tackled this particular problem before me, but I still like my custom function best—easy to grok, very quick to implement, and doesn’t rely on object names. It doesn’t work with filtered portals, and it does rely on the physical size of portal object, and number of rows displayed in layout. It also depends on the default WindowContentHeight, so please adjust the sizing to fit your needs.